Let me shatter an illusion. 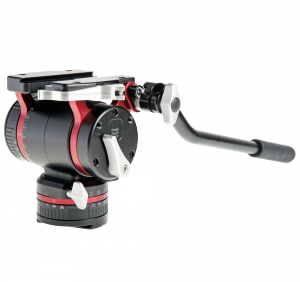 If you think you can shoot quality video without a Fluid Head, you’re wrong. If you want to do quality video, use a fluid head. Period… Wow! That’s a pompous declaration, and maybe some folks can pan smoothly without using a fluid head. But I can’t, and I haven’t seen anyone who can. But that’s me. Anyway, I recently started using the RRS FH-350 Fluid Head, as I had decided to do more videos in addition to shooting stills. Previously, I had tried panning via ball heads or gimbal heads and the results were always bad, jerky or wobbly, and very amateurish. My solution with those heads was to just shoot static videos, with no camera movement. That worked, but it did limit my video shooting severely. I just returned from Svalbard, the island archipelago high above the Arctic Circle and only 650 miles or so south of the North Pole. The only tripod head I used was the Fluid Head, which I used for stills and for videos. I’d been using the Fluid Head for a few months, on my trips to Texas and Arizona, but I didn’t have very many opportunities to really do panning. In Svalbard, I had plenty! I did a lot of my shooting with an 800mm lens, and a good portion of my shooting involved following action, like Brunnich’s Guillemots, a black and white bird that resembles a fast-flying penguin, Polar Bears striding across the ice, lounging seals, and Atlantic Walruses that we sailed passed. From my limited tests in Texas, I was fairly confident that I could smoothly follow the motion of anything I encountered, just as I could do so with my Gimbal-style head. This assumption proved true. However, left-right movements actually became easier and more accurate with the Fluid Head. In the past, with other heads, I often found that as I shifted my composition left or right, usually following a subject, I often over-shot my subject and I ended up having to correct the pan, swinging back towards the right if I initially had panned to the left. For still photography, this was an inconvenience. For video, it was death. It ruined the pan sequence. With the FH-350 Fluid Head I did not have that problem. Panning was smooth and controlled, which worked wonderfully for video. However, the panning feature also worked flawlessly for panning with my 800mm on fast-moving subjects when I was shooting stills, too. And, because I could adjust the tension or friction on the speed of the pan, I could adjust the head to get the feel that was just right for me. For my usual shooting I don’t customize the pan speed for various subjects, so one setting works for most of my shooting. I can lock the pan feature, too, if I know I’m not going to be panning. Of course, not all my shooting was done with an 800. I used a full spectrum of lenses, including a 100-400mm zoom and wide-angles ranging from 16-35, 24-105, and 24-300. Depending upon the lens, I either mounted the lens or the camera to the Fluid Head. Panning went smoothly in all cases. The Fluid Head doesn’t require a massive tripod, either. Here’ an example from when I returned home and discovered a Great Crested Flycatcher had reclaimed an old nest box mounted on a 9 foot pole. I missed the bird the last few years and I was anxious to get some new shots. The bird was used to our activity in the garden and I knew I wouldn’t need a blind. Instead, I rigged up two stepladders with a board laid down in between, which functioned as both my seat and my camera platform. Because of this very small shooting platform, I couldn’t use one of my usual RRS tripods. My TP-243 Ground-level Tripod did fit within the platform, so I mounted the Fluid Head on this small but sturdy tripod, via a B2-LR-II Lever-Release Clamp, and with it I shot both stills and videos of the flycatcher coming and going from the nest box. Now that I’m home, and reviewing my stills and my videos, I regret that I didn’t shoot more videos than I did. They really tell the story, and next time, in 2019, I’m sure that most of my shooting will be in video. For an idea what Svalbard has to offer, check out our video or check out our trip report.